For most people, inner peace is something elusive. For some it seems to be just a concept, a gnawing need or an unattainable desire. For others it may be a fleeting feeling that might be experienced in nature, in a church or temple, on a drug, at the beginning of a relationship or for a few moments after the successful acquisition of a desired object or goal. 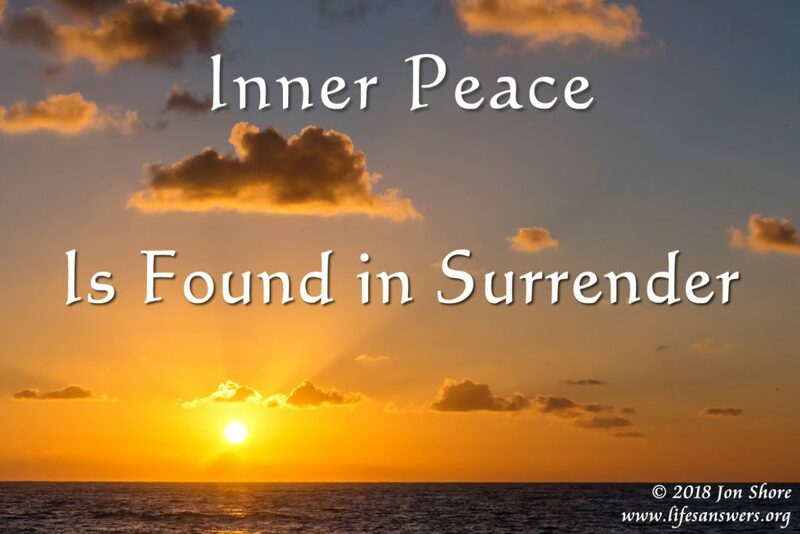 Unfortunately, inner peace that is dependent on any outer experience or chemical is always going to be transitory and is only a glimmer of what is possible. It may last moments, minutes, hours or days but, eventually, it will pass and even fade from your memory. When inner peace passes you will, again, search and strive for it like an addiction. That searching and striving may include accomplishing the next goal or the acquisition of the next object of your desire. When I have a net worth of xxxxxxxxxxxxxx I will feel fulfilled. When I have that person in my life or my ideal relationship, experience, job, car, boat, trip, company, or office I will have found peace. When I have traveled to xxxx and am sitting on that beach or mountain I will find peace. The seeking and striving are endless and will never lead to true inner peace. What is inner peace? Ask 10 people that question and you will get 10 different answers. But to create a definition for the purpose of this article let’s say that inner peace is; a calmness, a sensation of all-rightness, safety, fulfillment and a transcendent sense of satisfaction with the moment. Inner peace may also have elements of joy, happiness, bliss, stillness, quiet, wisdom and knowing. Where is inner peace? Inner peace is all around you and within you. It is an attribute of the quantum field that underlies all creation. It is in the air you breathe. It is a part of every sub-atomic particle that makes up your body, the objects around you, all life, everything seen and the unseen in the universe. Inner peace is inescapable. There is no place that inner peace is not. How do we feel and experience inner peace? If you are not feeling inner peace then it is because you are distracted from its presence. It is very easy to become distracted in this world. There are millions of distractions available. Every sight, sound, desire, object, drama, emotion, action, reaction and thought is a potential distraction. So, the simplest way to feel and experience inner peace is to be quiet and still. When you are still enough, you will feel and experience inner peace where it has always been. Over the years I have helped thousands of people find and experience inner peace through therapy and workshops. I have found that those who are truly committed and are willing to do whatever it takes to feel inner peace are usually the most successful at accomplishing this. Those who feel they must be in control at all times, or who associate their value or identity with their possessions, relationships, appearance, position or other attributes will have a more difficult time experiencing inner peace. Being completely still and quiet can be uncomfortable at first and can even be frightening. The stillness required to experience inner peace requires the letting go of all desires, emotions, thoughts and control. Therefore, experiencing inner peace must be more important to you than anything else. This does not mean that you will ignore your family, work, friends, health or any other aspect of life. In fact, your experiences with these facets of life will be improved in many ways. You will find that you enjoy life far more and that you radiate this sense of peace, confidence, fulfillment and comfort to others. You will also find that your life flows more smoothly and that you will find yourself in ‘the right place at the right time’ more often than ever before. How do we become quiet and still enough to experience inner peace? I usually suggest meditation and mindfulness as the first and best tools for experiencing inner peace. I have created many meditations and mindfulness practices for learning to be still and quiet and even some for letting go of all the distractions to feel and experience inner peace. There are other practices I have listed in my book, Freedom from Suffering, but I suggest you begin with meditation and mindfulness. I have posted many of these meditations and mindfulness practices here at www.Lifesanswers.org as well as at www.jonshore.net. If you wish to experience inner peace put these exercises into practice on a daily basis as if they are your number one priority. Letting go of distractions is very simple but it is not easy. It takes real commitment. Just reading about inner peace and understanding the concepts will not be the same as experiencing inner peace. Only you can take this beyond an intellectual exercise and into the realm of reality. To repost or reprint contact Jon at reachout@lifesanswers.org.